I will machine embroider this spicy design on the front chest of a new Gildan brand 50/50 sweatshirt. All sweatshirts are unisex sized. You can make the bike any color (just type it in the "Special Instructions" area). The price includes up to 4 children/salt & pepper shakers. Each additional child is $2.50 with a max. number of children of 12. When needing more than 4 names I will be reducing the size of the salt/pepper shakers. (Just so you are aware). If you need the children arranged in a particular order please type that in the "Special Instructions" area. 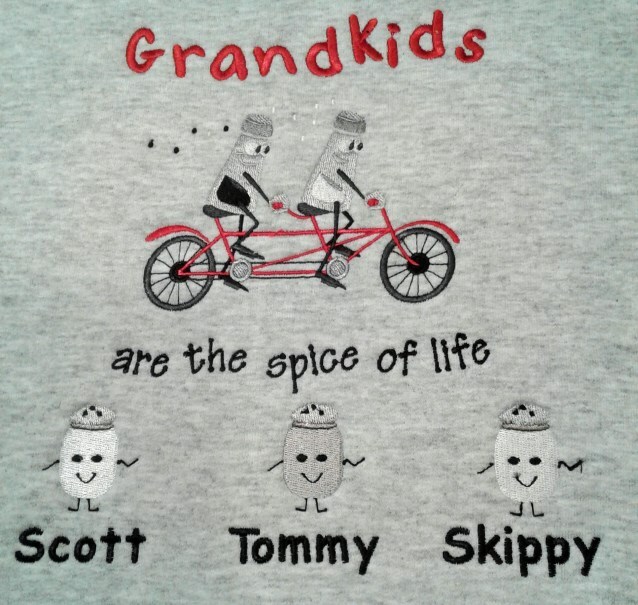 Great gift for the biker Grandma in your family!